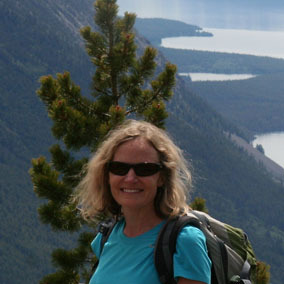 Sally N. Aitken is a Professor in the Department of Forest and Conservation Sciences and Director of the Centre for Forest Conservation Genetics at the University of British Columbia. She studies the population, conservation, and ecological genetics and genomics of forest trees. She is fascinated by the capacity of tree species to adapt to local conditions across large and ecologically heterogeneous ranges, and for individual trees to tolerate considerable temporal variation in climate over centuries or millennia, and investigates the capacity of populations to adapt genetically to projected future climates. She completed her PhD at the University of California, Berkeley and was a faculty member at Oregon State University prior to joining the Faculty of Forestry at UBC. She teaches forest biology, alpine ecology and conservation genetics, and is involved in forest genetic conservation initiatives in North America and Europe. Sally is happiest when outside traipsing around British Columbia’s mountains and forests.